Similar to the Kindergarten CogAT®, the first grade CogAT also assesses students’ developing comprehension and reasoning skills, critical thinking skills, quantitative reasoning and ability to detect relationships between figures and images. Although a first grade student will encounter similar questions to that of a kindergartener, the content is slightly more advanced. In some cases, a 1st grade student will have developed the fine motor and visual-spatial reasoning skills needed to use the bubble sheet. TestingMom.com members receive access to free bubble sheets, so if you join you can assess whether your child is confident enough to use the bubble sheet come test day. Below are several CogAT sample questions that are intended for the 1st grade level. Each practice question will reflect a specific subtest that your child will come across. 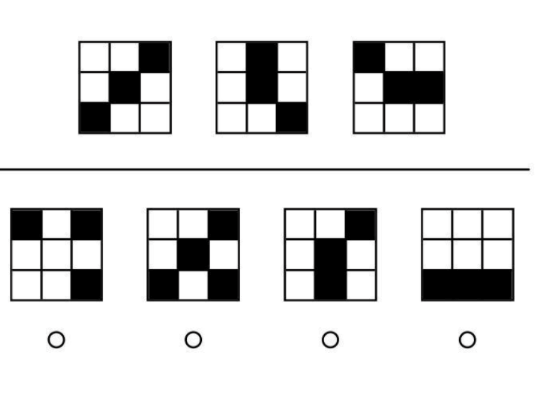 In this number puzzle subtest, children are shown 2 trains. Each must be pulling the same number of red “boxes”. 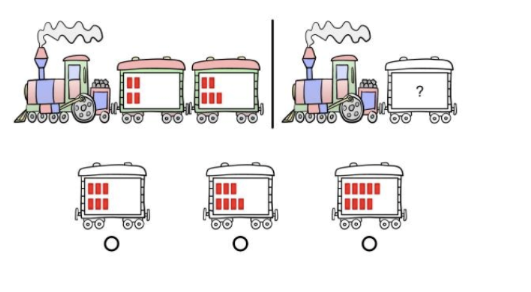 The child must identify which train should replace the train(s) with a question mark so that the train to the left of the chain is pulling the same number of red boxes as the train to the right of the chain. Look at the example below. Do you see how the first train is pulling two cars with 9 red boxes? Now look at the second train. It is pulling one car with 0 red boxes. We need to add another car where the question mark is so this train will be pulling the same number of red boxes as the first train. Which car should we add so the second train will be pulling 9 red boxes? For the verbal Analogies subtest, the child is shown a pair of items on top that are related to each other in some way. The child must determine how they are related. 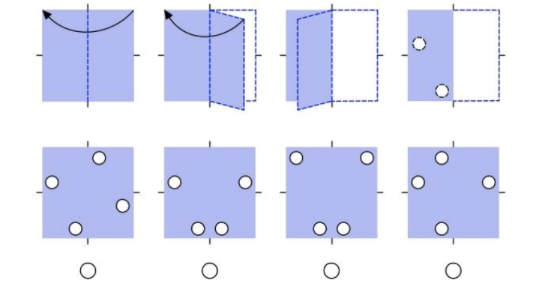 Then, the child must choose a picture from the possible answers that will have the same relationship with the picture on the bottom left. Look t the two pictures on top. They go together in some way. Now look at the picture in the bottom box, and then look at the answer choices. Do you see a picture among the answer choices that goes with the picture on the bottom the same way the pictures on top go together? Look at the example below. This is an abacus. The beads in the first 5 rods form a pattern or follow a rule. The beads in the sixth rod are missing. Can you choose the rod that goes in the sixth place that would complete the pattern or follow the rule? In the paper Folding subtest, the child sees a series of pictures that show a piece of paper being folded. Then, one or more holes are punched into the paper. The child must choose the answer that shows what the paper will look like when it is unfolded. 1.) The correct answer is option number 3 (with 9 red boxes). 2.) The correct answer is option 3 (always has a middle black square; 3 squares are black). 3.) The correct answer is option 2 (the fan). 4.) The answer is option 3 (a rule of each number repeating twice: 4,4,1,1,5,5). 5.) The correct answer is option 2. I am surprised as to how many that I got wrong as an adult. I think it’s good brain workouts. I also think that it’s very important for kids to practice/ study before each test. For the teachers to tell the kids the day before testing that they don’t need to study for these test is wrong. We all as parents want our kids to be prepared for what they are going to be tested for. Same with anything in life. We all like to be prepared. Thanks for the free practice sheets.